My Italian inlaws will probably be appalled at this, but I have come up with a simple pasta dish that I absolutely love. I almost always have the ingredients, so it is a good "I don't feel like grocery shopping" dish. 1 lb. of Italian sausage. I use the mild blend from my supermarket, because I can always add spice if I need to. This is the “loose” kind, not the kind in casings. If you have the kind in casings, you need to squeeze it out, and that’s kind of gross. Equipment: A cast iron pan and a non-reactive dutch oven such as Le Creuset. You do not need pot and colander for the pasta, which will be explained later in the instructions. Sweat the onion in the butter or oil in the cast iron pan and move into the Le Creuset dutch oven. Brown the sausage in the cast iron pan. I know you could do this in the Le Creuset, but I like to put it in the cast iron pan in big pieces and use my metal spatula to break it up into meatball size chunks, and you shouldn’t use metal in the Le Creuset because it will damage the enamel. The metal spatula won’t hurt the cast iron skillet, but the acid from the tomato sauce might (not permanently, but would hurt the seasoning of the cast iron, which is what keeps things from sticking. That’s why I use two pans, but only two. When the sausage is really crispy browned – and I like it to even be blackened on some sides – move it over to the dutch oven. Pour in the tomatoes, juice and all. You can cut up the tomatoes if you want, or put the in the metal pan and chop them roughly with the spatula, which is what I do, before quickly moving them to the enamel pan, where they won't hurt my lovely cast iron. Throw in the peeled and chopped cloves of garlic, as much as you want. And herbs. And the splash of wine. And the broth. And the tomato paste. And the anchovy paste. Simmer for as long as you can stand it, stirring only because you want to check to make sure it hasn’t boiled dry. Add more broth or wine or even water if it is getting kind of dry. Make sure that you have at least three inches of liquid at the top of the pot. Bring it up to a boil. Then take about ½ pound of the angel hair pasta, break it in half (probably do this in three or so bunches) and drop it into the boiling liquid. That’s right, don’t boil the pasta separately and drain it, just throw it right in to the sauce. It will cook right there. 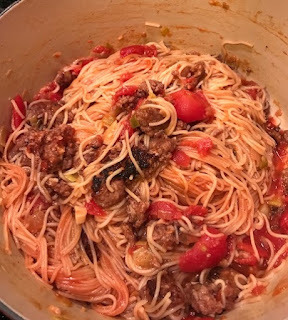 The pasta will thicken the sauce and absorb the sauce and taste wonderful, and because it is angel hair, it will cook pretty quickly. When it is all bendy and opaque, taste the sauce to see if you even need to add salt and pepper, then scoop some of the pasta and sauce into your preferred bowl or plate, add grated cheese, pour a glass of wine and sigh. This reheats wonderfully, even in the microwave. The pasta really soaks up the sauce, so you will probably need to add liquid. I'm pretty sure you could riff on this as much as you want. Saute some mushrooms with the onions? Why not? Want more sauce? Sure, use more tomatoes. Want it spicier? Knock yourself out. I love crispy chicken, too. 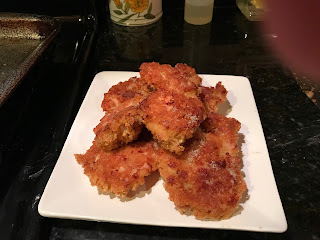 This uses the skinless, boneless chicken thighs that were on sale at my store, and uses crushed crispy rice cereal (I used generic, but you know what brand). Start about an hour and a half before you want to eat. And yes, you season each thing so that it is all seasoned. In a microwave-safe container -- I use a 4-cup Pyrex measuring cup, which is useful for so many things -- make a quick marinade of a couple of teaspoons of soy sauce, a couple of teaspoons of Worcestershire sauce, some garlic powder or garlic bits, pepper and any other seasoning that strikes your fancy. Add a little water. Microwave for 30 seconds. Add water to the 3 cup mark or so. Put the chicken thighs in a gallon zip-lock bag or a container that will let you cover them. Marinate for about 30 minutes. Don't marinate too long -- this is not like brining a turkey! Lightly oil a sheet pan -- not a cookie sheet, the kind with sides that will catch the oil. Put the cornstarch in a bowl or pie pan. Keep the crushed cereal in the zip bag. Add salt and pepper to each. Drain the marinade off the chicken and dip each piece in the cornstarch, one or two at a time, then in the egg, then in the cereal. Place on the baking pan. Drizzle a little oil on top of each piece -- not too much. When they are all coated and the oven has reached 400, put the sheet pan in the oven and turn it down to 350. Bake for 25 to 30 minutes, then turn and bake another 5 minutes or so. Chicken should be crispy on the outside and moist on the inside. So easy. Makes two servings. garlic, either fresh or "buds" that can be rehydrated in the liquid. Any other veggies that you want. Cut the chicken into pieces about 1 inch by 1 inch. Put in a bowl with about 2 T of the soy sauce, the chili sauce and the garlic for about 20 minutes -- not longer, it isn't tenderizing, it's flavoring. Take out the chicken and dredge it in the corn starch. Heat the oil in a heavy skillet until really hot. Fry the chicken, about 2 minutes per side. Remove. Meanwhile, mix up the leftover "marinade" with the rest of the soy sauce, a dash of Worcestershire sauce, and the cornstarch that's left from dredging the chicken. Don't worry, you're gonna boil it. Add about cup of water. Be prepared to add more later. Stir-fry the veggies for about a minute. If you are using "hard" veggies like carrots, put them in first and cook them longer, unless of course you have wisely shredded them very fine. Add the chicken back in. Add the sauce. Watch the sauce boil up and thicken. Add more water if necessary (depends on how much cornstarch was left over and how it thickens). Serve over rice or whatever. beta version-- I expect to refine this, which will eliminate some of the question marks. Also, I would be tempted to make an even bigger batch of the sauce because it is delicious. Veggies: I used mushrooms, red bell pepper, green onions, sliced. You can use as many veggies as you want! Sauce: Soy sauce, about 1/2 cup? ; water or stock, about a cup? 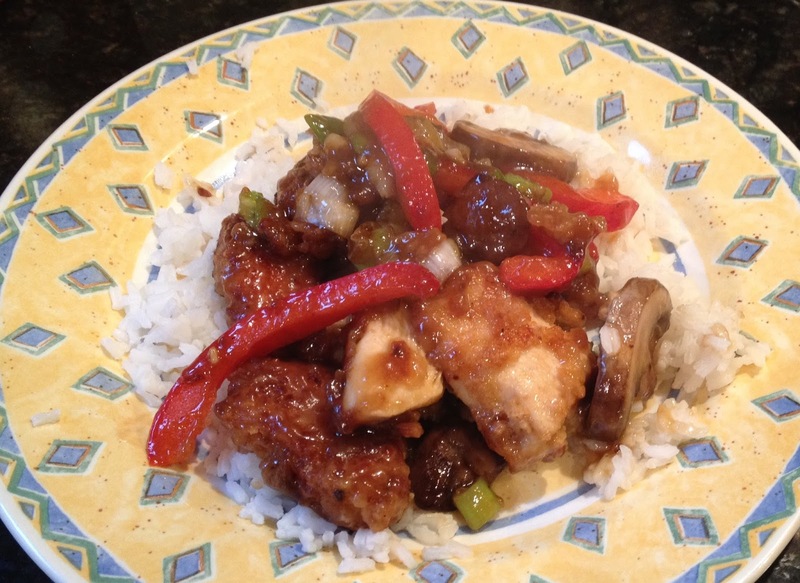 ; dash of Worcestershire sauce, about 2 T sweet red chili paste, dash of hot chili oil; minced garlic, about 4 cloves worth; crystallized ginger (minced or diced, about a tablespoon or more) -- or use grated fresh ginger, not ginger powder, but then plan on adding honey or sugar, maybe brown sugar. You need to keep tasting this as you mix it up so you have it as spicy and sweet as you want but not more than you want! Cornstarch -- lots. Maybe as much as 1 cup, although it doesn't all get used.?? Peanut oil or canola oil -- something with high smoke point -- for frying. About 1/2 Cup? Put water on to boil for rice. In saucepan, it takes 2 cups water for 1 cup long-grain white rice.When it boils, reduce to simmer, cover, stir occasionally. Or use rice cooker. Long-grain rice takes 20 minutes in saucepan, so meanwhile you can do the rest. Cut up the beef and veggies. Mix up the sauce and marinate the beef strips in it for about an hour. Optional waiting period, but worth it. 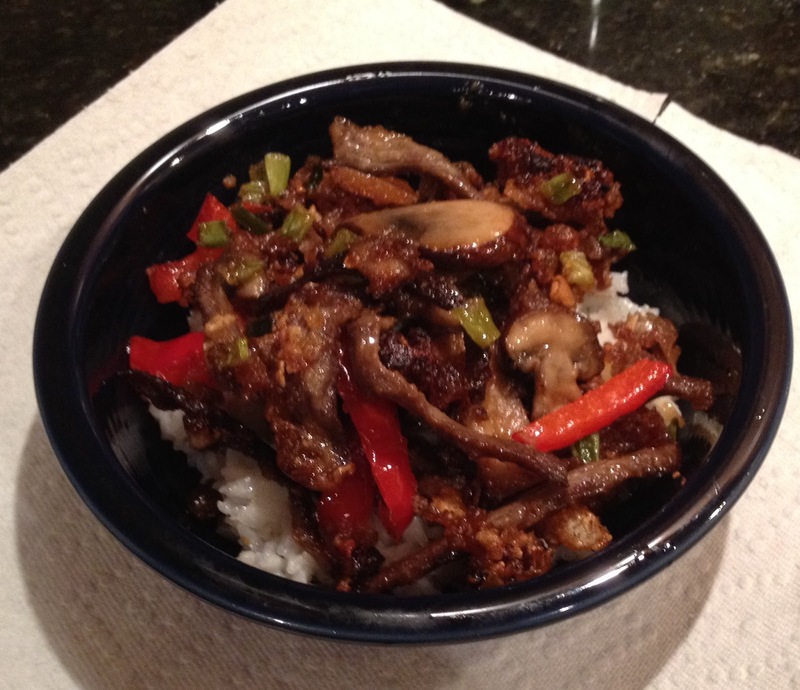 Pull out the beef strips, keeping the sauce, preferably in a microwave-safe vessel, and dredge or toss the beef in cornstarch to thoroughly coat. Let sit and dredge again to ensure complete coverage. Put about 1/2 inch - 3/4 inch of oil in cast iron skillet (or use a wok) and heat until a piece of beef sizzles immediately on hitting the pan. Fry the beef in batches -- about 1/2 at a time in a 12-inch skillet. Set aside. Add veggies to skillet. I had some cornstarch left in my dredging bowl, so I gave the veggies a quick toss there, too. Cook until tender but not soggy, just a minute or two. Remove from pan. Thoroughly heat the sauce; I start in microwave and then in the pan; when it is bubbling in the pan, add the beef and veggies back in. Serve over rice, or if you prefer, as I often do, noodles or couscous. This is the easiest way to make delicious chicken. Use the bone-in, skin-on thighs. If you really have to, use bone-in, skin-on breasts, but I'm telling you they won't be as good. At the store today, these 10 cost $5.72 -- way cheaper than boneless, skinless, and more flavor. I put them on the baking sheet pan. You could put parchment paper or foil underneath, but mine is pretty easy to clean. Do NOT use a flat cookie sheet -- you need the sides to catch the fat that will run off. Sprinkle the skin side liberally with kosher salt. Let rest at room temperature for about 15 minutes. No, it won't make them poisonous. Just gives the salt a chance to start working. Now slide them under the broiler, about 6 inches from the heat, for 10 minutes. After 10 minutes, the skin should have started to get bubbly and take some color, although it may not be brown yet. Turn off the broiler and set the oven temp to 325 and bake for 20 minutes. Check the internal temp, which should be about 170. Now put them back under the broiler for another 5 minutes or so until they brown up. I don't mind if they haven't all totally browned, because I will be reheating the leftovers in the toaster oven for the rest of the week and they'll get another chance! A lot of the fat will have rendered off. The skin should be crispy and decadent. Yes, some of the fat will have dripped into the meat, making it moist and luscious. And you will find that because of that, you will likely be satisfied eating just one piece and you won't be hungry half an hour later. And you won't need a sauce. I've lost 20 pounds in a few months, and this is one of the reasons. This makes six loaves of the German-style Christmas bread, each enough to serve six or eight people, with coffee. Dad makes the big batch because they freeze well and make good Christmas gifts for people like the choir director, the neighbor who checks the mail for you while you’re away and the kids’ piano teacher. “Keep one for yourself, and have five good friends,” he suggests. For the glaze: 2 cups confectioners sugar, 4 Tbs. milk and a dash of salt. Combine milk, butter, sugar, salt and cardamom and set aside to cool. Cool to lukewarm. When lukewarm, stir in four cups of the flour. Beat well. Add softened yeast and eggs and beat well. Stir in raisins, candied fruits, peels and nuts. 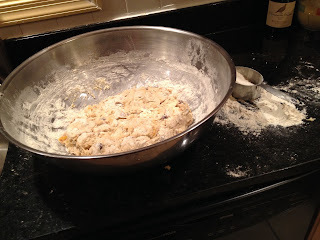 Place dough in large greased bowl, turning once to grease surface of dough. Cover and let rise in warm place to double size (1-1/2 to 2 hours). Punch down. Turn out on lightly floured surface. Divide into six equal parts. Cover with towel and let rest 10 minutes. Roll each part into an oval (about 10 inches long by 6 inches wide) to about 3/8 inch thick. Take one end and fold it over to within about an inch of the other end. 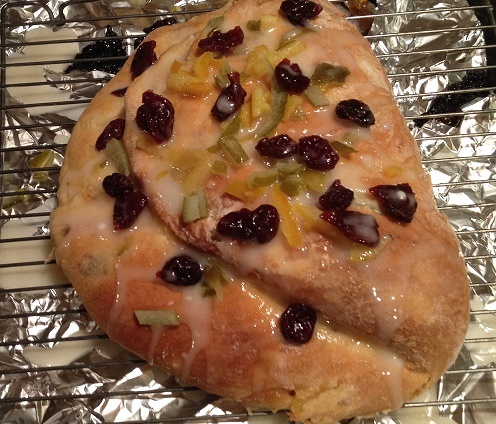 This is what gives it the “stollen” shape. Place stollen on a greased baking sheet. Cover with towel and let rise in a warm place until almost double, about an hour. Bake in moderate oven (375) for 15-20 minutes or until golden brown. Remove from oven and brush with glaze (see below). Decorate with cut up candied cherries, candied pineapple and citron, or any combination of the above, or with your home-made candied fruit if you are avoiding artificial coloring and flavoring. Glaze: Mix 2 cups confectioners sugar, 4 Tablespoons milk and a dash of salt. Stir into thin glaze. Serve in slices and provide plenty of butter. Frozen stollen can thaw in about half an hour at room temperature, or they can be wrapped in foil and heated in the oven. Here's how they look as they came out of the oven and are cooling off. Do not try to ice them when they aren't cool -- the icing will soak in and or drip completely off. Even after they cool, I will put a tray or waxed paper underneath to catch drips. 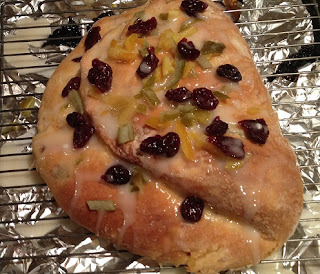 If you have recipes that call for candied fruit (Christmas stollen recipe to come later) but don't like the idea of those gummy-bear-artificial-colored candied fruits at the store, make your own. It isn't difficult, but it is time-consuming. But if you can boil water and peel an orange, you have the skills. Peel the fruit and cut into strips. (If you dice it now, it will fall through the wire rack, and you don't want that.) I found that peeling the orange the regular way is fine, but for the lime and lemon, I used a vegetable peeler. You don't have to worry about not getting the white part, the pith -- it will get taken care of in the process. I need each fruit peel separately, which is probably not necessary, but I wanted to keep them separate for later use. Put the peels in cold water in the big saucepan and bring to a boil. Boil for a minute or so. Drain in the colander and put back in the saucepan with fresh, cold water. Repeat. Taste. It will taste pretty awful, but is it crunchy or has it softened? If the peel is still too crunchy, repeat again. This process is called blanching. I put each different peel in a separate bowl once it was blanched, then moved on to the candying part. Meanwhile, make a simple syrup. It's simple. Equal parts sugar and water, so I used 2 cups sugar and 2 cups water to start with. If that more than halfway fills your saucepan, better keep an eye on it. You only have to bring this to a boil so the sugar dissolves completely, but it will try to boil over if your pan is too small or you walk away. So don't let that happen. the peel of 4 oranges, 4 lemons, and 4 limes, plus 2 packages of dried cherries, I made two batches of simple syrup, so 4 cups sugar and 4 cups water total. I happened to have some vanilla beans, so I tossed one in while making the simple syrup. Totally optional. I'm sure you could also throw in some spices, maybe a cinnamon stick? I'd make it plain, first. In the larger saucepan -- because we don't want boilovers -- put about 2 cups of the simple syrup and the fruit peel of your choice. Bring to a low boil and boil for about 20 minutes. Keep an eye on it so you don't end up with caramelized fruit peel, although I'm not sure that would be a bad thing. Having it boil over on the stove, that would be bad. When you have extracted and cooled a piece of the peel and it seems ready -- soft and a little sweet, but still fruit and not a gummy bear -- pour into the sieve over some sort of bowl or vessel to save the simple syrup (more on that later) and dump the peels to the rack which you have set over the baking pan lined with parchment paper. Or whatever rig you can assemble so the excess can drip off of the peel without making a huge mess. While it is still hot, you can sprinkle the peel with a little more sugar. Or not. Tastes vary. Save the simple syrup that you drain from the fruit! You now have citrus-flavored and/or cherry-flavored simple syrup. I haven't decided what to do with it, but I think a bartender friend of mine may have some ideas. When the candied peels and fruit have cooled, put in airtight containers or baggies and refrigerate. I chopped them before putting them in storage so I wouldn't have to do it when I was ready to use them.. I kept one batch of candied lemon peel for months, but mostly because I forgot I had it. My nephew and I found that it makes a good snack if you have leftovers after baking. This is me enjoying a limoncello in Rome on the last night of our trip to Italy. Funny thing is, I don't really like limoncello that much, but thought it would be great in a dessert. And wouldn't you know, The Barefoot Contessa just did a great fruit salad with limoncello. So now I can't. Oh, well.